Over 2,000 research articles from both academics and financial professionals have analyzed the link between companies’ environmental, social and governance-related (ESG) characteristics and their financial risk and performance (Friede et al., 2015). While Friede found little research concluding that using ESG criteria has impaired investment performance, there has also been no clear consensus on whether ESG has improved returns on a risk-adjusted basis. Why the lack of consensus? We find that many of the ESG investing methodologies used in studies were designed to meet social or ethical values and not financial objectives. To understand the link between companies’ ESG characteristics and their financial risk and performance, it is important to evaluate only the studies that use ESG methodologies specifically designed to identify financially relevant issues, such as MSCI ESG Ratings. More than 2,000 research papers have been written by academics and financial professionals about the pros and cons of investing with ESG criteria, according to one study (Friede et al., 2015). The authors found only a few papers showed that ESG had impaired performance, and no clear consensus has emerged as to whether ESG has enhanced risk-adjusted returns. There are (at least) three reasons for this lack of consensus. Values-based exclusions: Typically, portfolios screen out companies involved in certain business activities, such as the production and distribution of alcohol, tobacco or weapons. These screens, which dominated ESG investing in the 1990s, aim to align portfolios with investors’ individual values or preferences and are often referred to as socially responsible investing (SRI), or ethical investing. This contrasts with Friede, who dealt with actual performance, as opposed to expected performance. Research on these exclusionary screens focused on the reduced investment opportunity set that was expected to result in weaker risk-adjusted returns. At best, researchers found that SRI investors could anticipate similar financial results to investing in the full market.2 This study, however, did not take into account the difference between socially and financially driven methodologies. Impact screens: While values-based screens aim to reduce exposure to companies that impose costs on society at large (known as negative externalities), impact screens aim to identify companies that can drive positive social change — e.g., companies in clean technologies. Impact portfolios are typically fairly concentrated and can have strong active factor exposures and significant exposures to individual stocks that may not relate to their impact theme (Berube et al., 2014). Preference-based ESG ratings: The different ESG indicators are aggregated using a scorecard where the weights represent the preferences, based on norms or standards set by the rater. The resulting ESG score has no direct economic meaning, since it is based on a weighted sum of very different indicators, such as carbon emissions and gender diversity. However, the scorecard creates a measure that allows the rater to rank companies using this normative scale of what constitutes “good” or “bad” ESG. Financial-model-based ESG ratings: To create ESG ratings that may serve as a financial risk indicator in portfolio construction, a model is required that selects and weights ESG indicators based on an economic rationale. For instance, MSCI ESG Ratings translate ESG risk issues for a given industry into a common scale. Specifically, for each ESG risk indicator, MSCI ESG Research assesses the extent that this type of risk may impact future earnings or the assets of the company. Some researchers have assessed only one aspect of ESG. For instance, some researchers (e.g., Breedt et al., 2018, and Pollard et al., 2018, and earlier research from MSCI) have searched for an ESG factor premium and neglected other potentially stronger economic transmission channels, such as the identification of company-specific risks. Giese et al. (2019a) emphasized the need for a holistic approach by analyzing the impact of ESG ratings on a variety of risk and performance indicators following different systematic and stock-specific transmission channels (see Exhibit 1). The authors also provided an economic explanation for how ESG characteristics led to a financial impact in each of the proposed channels. Some researchers, including some at MSCI, have performed backtests or correlation studies, which typically depended on a given timeframe and investment universe and could not provide evidence for a causal relationship between ESG ratings and performance.4 Therefore, Giese et al. (2019a) emphasized the need to test ESG ratings within an economic model that allows for an assessment of causality. In brief, of the various ESG investment methodologies available, only ESG ratings based on a financial model are designed to identify potential ESG-related financially relevant risks. Much research has been focused on ESG methodologies — such as exclusionary screens or preference-based ESG ratings — that are not designed to improve risk-adjusted returns. It is not surprising that there is a lack of consensus on the value of ESG investing, as many papers focus on strategies where achieving superior financial returns is not the main objective. The type of economic transmission (Giese et al., 2019a), which can either be idiosyncratic (company-specific) or systematic (affecting a group of companies in a similar way). The financial objectives, which can be related to either risk or performance. For each of these categories, there is evidence that ESG ratings have been associated with a financial effect. Most research, however, focuses on just one or two of these aspects. To see a fuller picture, we seek to provide a consolidated overview across all four categories, based on MSCI research (Exhibit 2). Darker shades indicate increasing levels of confidence in the economic arguments and statistical results. Data history has important implications for our findings. In general, historical data series for ESG ratings applied to a global universe were much shorter (e.g., MSCI ESG Ratings have fully covered the universe of MSCI World Index companies since 2007) and of lower frequency (typically annually) compared to other areas of finance — e.g., credit ratings or equity factors — making it challenging for researchers to achieve similar confidence levels. We get more robust results from analyzing idiosyncratic transmission channels, which offer several thousand ESG company ratings per year. In contrast, systematic transmission channels have a limited time history and thus are likely to offer lower levels of statistical confidence. The level of economic confidence — i.e., being able to explain the economic reasons (or economic transmission channels) for why ESG characteristics have a causal effect — is also significant. Idiosyncratic risk: Companies we analyzed with high MSCI ESG Ratings have historically shown lower financial-drawdown frequencies, while controlling for other factors. For example, the MSCI ESG Leaders Indexes (which target companies with the highest ESG-related performance in each sector of the parent index) have avoided a number of major ESG-related risk incidents over their live track records. While ESG research cannot predict future incidents, ESG ratings provided an indicator that corresponded with significant differences in the frequency of these incidents happening during the respective study periods. For example, see Jo et al. (2012), Hoepner et al. (2013) and Giese et al. (2019a). These results are intuitive, as companies with high ESG ratings were considered to have had a greater ability to manage and mitigate company-specific risks than lower-ranked sector peers. Systematic risk: Many of the companies with high MSCI ESG Ratings that we examined historically showed lower levels of systematic risk (see Dunn et al., 2015, and Giese et al. 2019b) than companies with poor ESG ratings. For instance, they have shown lower levels of volatility in MSCI’s Barra Global Equity Factor Model — Long Term Horizon (GEMLT) while controlling for other factors. In addition, the MSCI ESG Leaders Indexes have shown lower levels of drawdowns among their constituents in crisis situations (Giese et al., 2019b). The economic rationale is again intuitive: Companies with strong ESG characteristics were more resilient when faced with changing market environments, such as fluctuations in financial markets and changes in regulation. Idiosyncratic performance: Companies within the MSCI Index that had high ESG ratings were more profitable and paid higher dividend yields, while controlling for other factors (i.e., size, industry and region) from May 2007 through November 2017 (Giese et al., 2019a). Fatemi et al. (2015) found similar results in their empirical analysis. They explained that stronger ESG characteristics were linked to better business practices, such as attracting more talented employees, achieving better innovation management, creating long-term business plans and incentive plans for management, and providing better customer satisfaction. Systematic performance: It is not clear, however, whether ESG can be considered a new factor that has earned a premium over time. Several researchers have observed that companies with high MSCI ESG Ratings outperformed those with low ratings. They also uncovered clear regional differences: Evidence for ESG characteristics having a positive impact on stock performance was strongest in the emerging markets and Europe, but weaker in the U.S. (see Dunn et al., 2015, Frederiksson et al., 2018, and Giese et al. 2019b). However, some of the positive performance results may have been due to exposures to other equity factors (Kurtz et al., 2011). Some researchers have tested the existence of an ESG factor premium while controlling for other factors, with varying results: Breedt et al. (2018) found no evidence for ESG ratings’ positive or negative performance impact, while Melas et al. (2016) found that MSCI ESG Ratings were a weak factor for explaining risk and performance during the study period when accounting for other factors. However, Pollard et al. (2018) found evidence supporting an ESG premium in their analysis. Again, lack of a long-term time series for ESG ratings may explain this inconclusiveness. However, empirical research has provided evidence for a systematic performance impact for ESG rating changes (ESG momentum).8 For example, see Khan et al. (2015), Nagy et al. (2016) and Giese and Nagy (2018). For instance, in the analysis of Giese and Nagy (2018), ESG upgrades outperformed ESG downgrades within the MSCI World Index from 2007 to 2018, while controlling for all other factors in the MSCI GEMLT model. This observation also provides evidence for a causal relationship between ESG characteristics and levels of valuation. Additional empirical evidence for a causal link between ESG and financial performance was found by researchers analyzing the financial impact of enhanced regulatory-disclosure standards for ESG-related risks (Grewal et al., 2018). In short, empirical research provided evidence of a risk-reducing effect when ESG ratings are used in portfolio construction. Statistical confidence levels were higher for idiosyncratic risks due to the larger relative sample size that was used. While the bulk of academic and industry studies fail to achieve consensus on whether ESG characteristics have affected performance, in reality most of these studies do not focus on strategies that placed an emphasis on financial returns. To examine strategies focused on obtaining a financial benefit from ESG ratings, we looked across both the type of economic transmission (idiosyncratic or systematic) and the financial objective (risk or performance). We found that the statistical level of evidence that can be obtained from empirical research was driven by both the strength of the financial characteristics and the available data history. The finding supported with the highest statistical confidence level is the result that ESG characteristics had a positive effect on risk, in particular in mitigating tail risks. There is some evidence that ESG momentum (changes in ESG characteristics) was linked with portfolio performance, but a longer time series is needed to verify the existence of an ESG risk premium. (1)This paper controlled for company size, industry and region in its analysis of stock-specific risks. Sectors are controlled for by using MSCI Industry-adjusted scores. Size is adjusted by regressing ESG scores versus the size of the company and using the residuals of this regression as size-adjusted ESG scores. (3)Eccles and Strohle (2018) explore the historical origins and recent evolution of various ESG scoring and rating approaches, highlighting a distinction between value-driven and values-driven approaches. A common library of ESG data and metrics can be used to reflect either normative preferences (such as scoring companies on contravention of different global norms or involvement in controversial business lines or practices) or financially driven considerations. (4)See Harvey et al. (2016) and Krueger (2018). (5)Giese et al. (2019a) controlled for company size, industry and region in their analysis of stock-specific risks. (6)There have been many such incidents in the MSCI ACWI Index since the launch of MSCI ESG Ratings in 2007, including BP’s oil-platform accident, Volkswagen’s emission scandal, Equifax’s and Facebook’s respective data-security breaches and Petrobas’s bribery scandal. None of these companies were constituents of the live MSCI ACWI ESG Leaders Indexes at the time the incidents occurred, because their ESG Ratings at the time of the selection were below average. (7)For instance, Giese et al. (2019a) used the MSCI World Index from May 2007 through November 2017 for their empirical assessment. (8)MSCI ESG momentum scores measure the year-to-year change in companies’ MSCI ESG Industry-adjusted ESG score. To create MSCI ESG Ratings, these scores are then are mapped onto a ratings scale from AAA to CCC. Asness, C. (2017). “Virtue is its Own Reward: Or, One Man’s Ceiling is Another Man’s Floor.” AQR research report. Berube, V., Ghai, S. and Tetrault, J. (2014) “From indexes to insights: The rise of thematic investing.” McKinsey & Co. Research Insight, December 2014. Desclee, A., L. Dynkin, A. Maitra and S. Polbennikov. (2016). “ESG Ratings and Performance of Corporate Bonds.” Barclays Quantitative Portfolio Strategy Paper. Dunn, J., S. Fitzgibbons and L. Pomorski. (2016). “Assessing Risk through Environmental, Social and Governance Exposures.” AQR research paper. Eccles, R., M. Kastrapeli and S. Potter. (2017). “How to Integrate ESG into Investment Decision-Making: Results of a Global Survey of Institutional Investors.” Journal of Applied Corporate Finance, Vol. 29. No. 4, pp. 125-133. Fatemi A., I. Fooladi and H. Tehranian. (2015). “Valuation Effects of Corporate Social Responsibility.” Journal of Banking and Finance, Vol. 59C, pp. 182-192. Frederiksson, H., E. Porse and A. Bergem. (2018). “ESG — Rested and Ready.” Nordea Research Insight. Friede, G., T. Busch and A. Bassen. (2015). “ESG and Financial Performance. Aggregated Evidence from more than 2,000 Empirical Studies.” Journal of Sustainable Finance and Investment, Vol. 5, No. 4, pp. 210–233. Fulton M., B. Kahn and C. Sharples. (2012). “Sustainable Investing: Establishing Long-Term Value and Performance.” Deutsche Bank Climate Change Advisors. Giese, G., L.-E. Lee, D. Melas, Z. Nagy and L. Nishikawa. (2019a). “Foundations of ESG Investing: How ESG Affects Equity Valuation, Risk and Performance.” Forthcoming, Journal of Portfolio Management. Giese, G., L.-E. Lee, D. Melas, Z. Nagy and L. Nishikawa. (2019b). “Performance and Risk Analysis of Index-Based ESG Portfolios.” Forthcoming, Journal of Index Investing. Giese, G., L.-E. Lee and Z. Nagy. (2018). 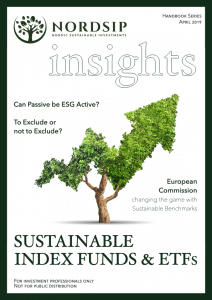 “How Markets Price ESG — an Analysis using ESG Momentum.” MSCI Research Insight. Grewal, J., E. Riedl and G. Serafeim. (2018). “Market Reaction to Mandatory Nonfinancial Disclosure.” Management Science. Hamilton, S., H. Jo and M. Statman. (1993). “Doing Well While Doing Good? The Investment Performance of Socially Responsible Mutual Funds.” Financial Analysts Journal, Vol. 49, No. 6, pp. 62-66. Harvey, C., Y. Liu and H. Zhu. (2016). “… and the Cross-Section of Expected Returns.” Review of Financial Studies, Vol. 29, No. 1, pp. 5–68. Hoepner, A., M. Rezec and S. Siegl. (2013). “Does Pension Funds’ Fiduciary Duty Prohibit the Integration of Environmental Responsibility Criteria in Investment Processes? A Realistic Prudent Investment Test.” Working Paper in Responsible Banking & Finance, No. 13-010, School of Management, University of St Andrews. Jo, H. and H. Na. (2012). “Does CSR Reduce Firm Risk? Evidence from Controversial Industry Sectors.” Journal of Business Ethics, Vol. 110, pp. 441-456. Khan, M., G. Serafeim and A. Yoon. (2015). “Corporate Sustainability: First Evidence on Materiality.” Accounting Review, Vol. 91, No. 6, pp. 1697-1724. Krueger, P. (2015). “Corporate Goodness and Shareholder Wealth.” (2015). Journal of Financial Economics, Vol. 115, No. 2, pp. 304-329. Kurtz, L. and D. DiBartolomeo. (2011). “The Long-Term Performance of a Social Investment Universe.” Journal of Investing, Vol. 20, No. 3, pp. 95-102. Luther, R. and J. Matatko. (1994). “The Performance of Ethical Unit Trusts: Choosing an Appropriate Benchmark.” British Accounting Review, Vol. 26, pp. 77-89. Melas, D., Z. Nagy and P. Kulkarni. (2016). “Factor Investing and ESG Integration.” MSCI Research Insight. Nagy, Z., A. Kassam and L. Lee. (2016). “Can ESG Add Alpha? An Analysis of ESG Tilt and Momentum Strategies.” Journal of Investing, Vol. 25, No. 2, pp. 113-124. Pollard, J., M. Sherwood and R. Klobus. (2018). “Establishing ESG as Risk Premia.” Journal of Investment Management, Vol. 16, No. 1. The information contained herein (the “Information”) may not be reproduced or redisseminated in whole or in part without prior written permission from MSCI ESG Research. The Information may not be used to verify or correct other data, to create any derivative works, to create indexes, risk models, or analytics, or in connection with issuing, offering, sponsoring, managing or marketing any securities, portfolios, financial products or other investment vehicles. Historical data and analysis should not be taken as an indication or guarantee of any future performance, analysis, forecast or prediction. MSCI ESG Research is provided by MSCI Inc.’s subsidiary, MSCI ESG Research LLC, a Registered Investment Adviser under the Investment Advisers Act of 1940. MSCI ESG Research materials, including materials utilized in any MSCI ESG Indexes or other products, have not been submitted to, nor received approval from, the United States Securities and Exchange Commission or any other regulatory body. None of the Information or MSCI index or other product or service constitutes an offer to buy or sell, or a promotion or recommendation of, any security, financial instrument or product or trading strategy. Further, none of the Information is intended to constitute investment advice or a recommendation to make (or refrain from making) any kind of investment decision and may not be relied on as such. The Information is provided “as is” and the user of the Information assumes the entire risk of any use it may make or permit to be made of the Information. NONE OF MSCI INC. OR ANY OF ITS SUBSIDIARIES OR ITS OR THEIR DIRECT OR INDIRECT SUPPLIERS OR ANY THIRD PARTY INVOLVED IN THE MAKING OR COMPILING OF THE INFORMATION (EACH, AN “INFORMATION PROVIDER”) MAKES ANY WARRANTIES OR REPRESENTATIONS AND, TO THE MAXIMUM EXTENT PERMITTED BY LAW, EACH INFORMATION PROVIDER HEREBY EXPRESSLY DISCLAIMS ALL IMPLIED WARRANTIES, INCLUDING WARRANTIES OF MERCHANTABILITY AND FITNESS FOR A PARTICULAR PURPOSE. WITHOUT LIMITING ANY OF THE FOREGOING AND TO THE MAXIMUM EXTENT PERMITTED BY LAW, IN NO EVENT SHALL ANY OF THE INFORMATION PROVIDERS HAVE ANY LIABILITY REGARDING ANY OF THE INFORMATION FOR ANY DIRECT, INDIRECT, SPECIAL, PUNITIVE, CONSEQUENTIAL (INCLUDING LOST PROFITS) OR ANY OTHER DAMAGES EVEN IF NOTIFIED OF THE POSSIBILITY OF SUCH DAMAGES. The foregoing shall not exclude or limit any liability that may not by applicable law be excluded or limited. Privacy notice: For information about how MSCI ESG Research LLC collects and uses personal data concerning officers and directors, please refer to our Privacy Notice at https://www.msci.com/privacy-pledge.